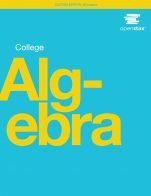 Published by OpenStax, College Algebra provides a comprehensive and multi-layered exploration of algebraic principles. The text is suitable for a typical introductory Algebra course, and was developed to be used flexibly. The modular approach and the richness of content ensures that the book meets the needs of a variety of programs. College Algebra guides and supports students with differing levels of preparation and experience with mathematics. Ideas are presented as clearly as possible, and progress to more complex understandings with considerable reinforcement along the way. A wealth of examples – usually several dozen per chapter – offer detailed, conceptual explanations, in order to build in students a strong, cumulative foundation in the material before asking them to apply what they’ve learned. College Algebra Cover is copyrighted by Rice University. It is not subject to the Creative Commons license and may not be reproduced without the prior and express written consent of Rice University. College Algebra (OpenStax) by Jay Abramson, Arizona State University is licensed under a Creative Commons Attribution 4.0 International License, except where otherwise noted. For a course leading into a department-specialized Calculus course that does not require Trigonometry at all, this text could be a good fit. Aside from missing trig, the text has complete and solid coverage of the rest of the material needed. The text does provide an effective index and glossary. For the web edition, glossary information is found at the end of every section, rather than in a separate section at the end of the table of contents. I cannot comment with great certainty on whether the text is error-free, as I was not able to make use of it for the class I originally intended. However the material I reviewed was well-written, clear, and provided a balanced perspective on topics where individual instructor approaches may vary. The content was up-to-date, and web content would be easy to update; I would also presume that the print-like PDF edition would be easy for them to edit as they seem to have gone to the effort to create a good content workflow for generating the text. I was very impressed with the clarity provided in the text's writing and content layout. New concepts are given a concise but informative introduction, followed by a summary of steps to take to apply the new concept. Q&A sections discuss common misconceptions, again in an accurate but concise manner. Jargon is highlighted in bold and defined when first used, and each section also includes a glossary. I believe it is, based on the content reviewed. The text is indeed divided into appropriately-sized subsections and should be easy to work with to assign different sections as the course progresses. The topics are presented in a sequence appropriate for the material. The web edition makes good use of the medium by hiding all answers to questions, including Q&A questions and worked examples, behind a simple click-to-reveal prompt. This unclutters the page for the reader while giving the student time to work out problems without immediately scanning through to the result. One caveat here: the online web edition does not number any of the review exercises, presumably because the solutions can be seen right beside the question with a simple click. If assigning particular practice problems, though, be aware that question numbers are only in the PDF / print edition. Not only was the interface free of issues, but it made good use of the web medium for simple interactivity by hiding solutions and discussion 'answers' behind a click-to-reveal. Math typesetting worked well on the web edition, as well as looking good in PDF. Graphs are large and clear. There were no grammatical errors that I found. The text includes example characters of a variety of ethnicities. It does not specifically provide Indigenous perspectives. The text tends towards minimalist descriptions of the content, which is mostly good in that it's less overwhelming for the student. However I would only use this text with the assumption that important new concepts will get a more in-depth treatment during class. Exercises included may be on the too-easy side, depending on the level of complexity you prefer to quiz students at.